there's a simple way you can start losing weight from tomorrow while eating Nigerian foods you love . You just have to be a little sneaky (I'll show you how). If that sounds interesting to you...then...this guide is for You. The one and ONLY thing that causes weight loss. What's the One and ONLY Thing that Causes Weight Loss? I’m stressing on calories because the answer to almighty question "how to lose weight" has all to do with Calories. By the way, a calorie is just a fancy word used for the "unit measurement of the energy" obtained from food & drinks (just as the unit measurement of distance is meter ). If everything you eat contains calories, and everything you do burns calories then why do you get fat?!! The answer is simple…. You eat more calories than your body uses (needs). You can consume the SAME amount of calories your body needs/uses each day; this is known as your calorie maintenance level. ​Simple... Your weight remains exactly the same because your body ends up using up all the calories. you can consume MORE calories than your body needs; This is known as a caloric surplus. Easy...You’ll gain weight because of excess calories your body did (or could) not use. lastly, you can consume LESS calories than your body needs; This is known as a caloric deficit. Yes, you guessed right, you’ll lose weight because your body uses up stored body fat (or muscles) to compensate for the shortage of calories. Now, note this: Caloric deficit is the one and only cause of weight loss. Did you catch that? You didn’t? Ok, I’ll repeat (because it’s super important). Caloric deficit is the “one and only” cause of weight loss. What does Caloric Deficit Mean to You as a Nigerian? It means you don't have to eat only salad with water to lose weight. You can set up your very own delicious Nigerian weight loss diet plan. The "Dirty Little secret" Of How All Weight Loss Diets On The Planet Work. they are all based on calorie deficit every single time... How? Low carb diet: required to eat less carbs. Low-fat diet: required to eat less fat. Green smoothie diets: drinking only green smoothie. Clean 9 diet: Take large pills and eat only 600 calories. Exercising is also a way to create a caloric deficit because when you work out, your physical activity for the day increases and you burn more calories than usual. For example, if your maintenance level was 2000 calories, you could burn 500 extra calories through exercise! Exercise alone is almost useless for weight loss. why? I'll explain myself. Why is Exercise Alone Useless For Weight Loss? Exercise requires more work, willpower and time to burn off 500 calories daily compared to just eating 500 calories less daily. To illustrate this point, see this infographics I did below! From the Infographic above, you can see that it's best not to eat than to do the exercise required to burn the exact same amount of calories. Now, don't get it twisted. I’m not saying you should not exercise. The reason I’m telling you this is because most people feel a sense of false security when they exercise. They do a little exercise and then feel its okay to eat food they shouldn’t. So the ideal weight loss scenario will be a proper eating plan (first!) combined with a proper workout plan. How many calories do you need to eat daily to lose weight? You must know the exact calories your body needs daily (i.e calorie maintenance level ) THEN eat Less than maintenance level... full stop. How to get your daily calorie maintenance level? To make your life easier and not waste your time doing boring maths, I have provided a daily calorie﻿ requirement calculator. It works based on Mifflin-St Jeor equation- it uses your weight, age, gender and activity level to calculate your calorie maintenance level. All you need to do is fill your details and press "Calculate" and voila! You get your estimated calorie maintenance number. Okay, you know your calorie maintenance level, the next and most important step is to eat 20% Less than your calorie maintenance number. Your Ideal Daily Caloric Reduction should be 20% Less your daily calorie maintenance level. Now, why 20% less than your calorie maintenance level? The answer is simple. It puts you in the “sweet spot” of the ideal weight loss rate. So what is this “ideal weight loss rate” and why is it important? What’s The Ideal Weight Loss rate? Ideal weight loss rate is simply the rate at which you lose weight that helps you “maximise” fat loss and “minimise” water and muscle (protein) loss. Most doctors and nutrition experts say that the ideal, healthy, safe, smart and right amount of weight to lose for most people fall between the 0.5 to 1kg weekly. So what does your body do? It tries to survive by holding to the fat and burns your muscles for energy and remove water instead (which leads to cravings, anger, tiredness, irritability.. etc.). That's a topic for another day. Besides the many health implications of fast weight loss, studies upon studies upon studies have shown that people who lose weight too fast end up gainig more weight at the end of the day. It is easier to do (sustainable over a long-term). You know how many calories to eat, the Next most important thing to know is Where these calories should come from. I have only mentioned calories. What about protein, carbs and fat? Don't they matter?". Does protein, Carbs and Fat matter? As you know already, you can lose weight on any type of diet in the world! (including our Nigerian diet) as long as you eat less than your body’s daily calorie needs. You see, different foods affect hunger and hormones in different ways. The foods that make up your diet can either make losing weight easy or extremely difficult because all calories (foods) are NOT created equal. How many calories you eat and Where these calories come from is "key". What’s the Only Diet that Guarantees Fast and Safe Weight Loss? The diet is called a "Balanced Diet". Which limits/bans you from eating certain types of food or which tells you to eat only a certain type of food. The truth is doctors and nutrition expert advice you should eat a balanced diet and not limit some certain type of food. That said, your weight loss diet should contain all the classes of food in a significant amount! Protein is absolutely important because your body cannot function properly without protein. If you didn’t know, your skin, nails, hair, muscles, bones and some hormones are made up of protein. So which foods should you be eating that contains protein? Finally, before we go to the next class of food, It worth knowing that 1 gram of protein contains 4 calories. So for every gram of protein you eat, you’re taking in 4 calories. The answer is YES! and NO! Let me explain…. I know that dietary fat has a bad reputation due to bad information that has been spreading over the years BUT not all fats are bad. The foods that contain the bad fats are listed in the “what not to eat” section of this post. Here are…Good Sources Of "Good Fat"
lastly, 1 gram of fat contains 9 calories.This means for each gram of fat you consume, you're taking in 9 calories. With the “low carb” craze around, many people think eating carbs makes them fat! Simple carbs (AKA “bad” carbs) should usually be limited/avoided. Simple carbs are bad because of they are quickly digested by the body, which has a bad effect on our blood insulin levels. And they're addictive and don't keep you full for long. The "bad" type of carbs would be found in the typical snack/junk and most processed foods (examples are listed in the “Food not eat” section). On the other hand, Complex carbs (AKA “good” carbs) are slower to digest, should be where you get most of your daily carbs intake from. 1 gram of carbs contains 4 calories.This means that each gram of carb you eat you’re taking in 4 calories. Remember, If you overeat good carbs, protein or good fat you'll still get fat! Foods high in sugar also leads Insulin resistance, making it difficult for your body to access stored body fat causing the brain to think that you’re hungry. Then you eat more and more. They are low in nutrients and fibre which causes you to get hungry again in no time after eating them. Processed foods are addictive which makes you eat too much of them leading to more calories in. We know that gram for gram fats contains the highest number of calories compared to protein and carbs. Food high in trans fats are bad for weight loss and can be dangerous to your health. Fried foods, Butter, margarine, Cheese, Biscuit, cakes etc. are drinks you should stay away from because they add significantly to your calorie intake per day and make losing weight difficult. If you want to know why these drinks are dangerous, go her﻿﻿e. In summary, with these drinks, you can consumes hundreds of calories in a few minutes, which you can hardly happen if you were to eat real food. So, stick to water and maybe green tea (of course without milk and sugar). Das it! for this post. The one and ONLY requirement to lose weight is a calorie deficit ( i.e calorie Reduction) to put it in another way eat and drink a little less calorie than your body needs daily and you’ll lose weight. You can lose weight on any diet in the world (including our Nigerian diet) but some are just more difficult to stick to than others. Exercising is about 30% of your weight loss battle ( and your diet is 70%). Don't drink your calories, drinks like soft drink, juice, alcohol are full of calories but No nutrients. 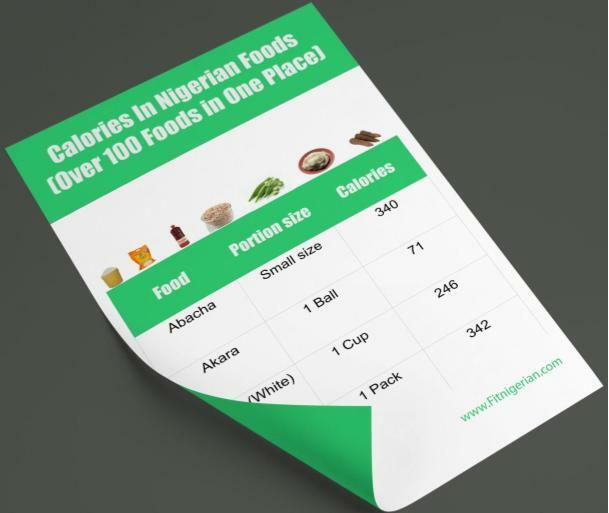 Finally, don't forget to download "Calorie content of over 100 Nigerian Foods" So you know how many calories you're consuming. Just click on the picture below to download it. 1. Please share this post with your friends and family on social media using the share buttons on this page. Thanks. ​2. Comment to let me know if you have any questions, suggestions or just to tell me you love me.